This case study is based upon the data reservoir of the Unnayan Onneshan research institute, which undertakes several biodiversity conservation programmes and conducts research on the Sundarbans. A significant amount of data was collected through participatory observations, questionnaire surveys, key person interviews and focus group discussions. The study particularly draws on the traditional knowledge of the forest people of three cooperatives that the Unnayan Onneshan helped to set up—the Harinagar Bonojibi Bohumukhi Unnayan Samity, the Koyra Bonojibi Bohumukhi Unnayan Samity and the Munda Adivasi Bonojibi Bohumukhi Unnayan Samity. Members pursue their livelihoods as wood and golpata collectors (Bawalis), fishermen (Jele), honey collectors (Mouals), shell collectors (Chunary), and crab collectors. This chapter presents a case study of the Sundarbans of Bangladesh to examine whether the livelihood patterns of indigenous people and local communities (IPLCs) have contributed to the conservation and sustainable utilization of the biodiversity resources of this largest mangrove forest ecosystem of the world. In the face of severe deterioration of the natural environment, the challenge is to explore ways to conserve natural resources while allowing sustenance of people’s livelihoods. The definition of livelihood is extensively discussed. The most popular definition is by Chambers and Conway (1992), which states that “a livelihood comprises people, their capabilities and their means of living including food, income and assets (stores, resources, claims and access)”. The term socio-ecological production landscapes and seascapes (SEPLS) was coined to refer to areas shaped by production activities characterized by harmonious human-nature interactions that can sustain biodiversity while also supporting human well-being (Bergamini et al. 2013). The conceptualization of the linkage between these two terms, “livelihoods” and “SEPLS”, can be interpreted to recognize that humans have adapted to local ecosystems by carefully modifying their features and derive livelihoods from close interactions with their surroundings (Ichikawa 2013, p. 57). This study recognizes this linkage and shows that the Sundarbans forest region is a case of a highly productive ecosystem that provides a wide range of valuable forest resources where the local people’s livelihood strategies play a central role in the management of these resources. This, accordingly, proves the underlying complementary relationship between human beings and nature in the course of supporting the well-being of the both. In the next section, a brief profile of the Sundarbans is presented by identifying this mangrove forest ecosystem as a SEPLS example. The third section offers a brief description of the activities carried out by the cooperatives, facilitated by the Unnayan Onneshan. Key results have been interpreted with necessary explanations in the fourth section. The penultimate section discusses the results to wrap up the major findings which can help practitioners and policy makers apply such lessons in broader contexts to tackle future challenges. The final section ends with concluding remarks. The three perspectives drawing on the SEPLS concept—structure, benefits and changes—deepen understanding on various types of production landscapes and seascapes (Ichikawa 2013). This chapter also uses these perspectives to present the Sundarbans as a perfect case of a SEPLS. Firstly, key characteristics of this mangrove ecosystem, including its location and the dynamic nature of different types of habitats (forest, wetlands, coastal), have been briefly outlined to define its structure. Thereafter, the diverse benefits the Sundarbans provides in the form of maintenance of biodiversity and supply of goods and services are highlighted. Lastly, the chapter presents an overview on major changes in the Sundarbans, resulting from the interactions between people and nature. The Sundarbans is a symbol of majestic beauty and tranquillity, a wilderness of nature and a hotspot of biodiversity. It is located at the great delta of the Ganges, Brahmaputra and Meghna (GBM) rivers at the edge of Bay of Bengal, and is the largest contiguous single-tract mangrove ecosystem in the world (Figure 1). It is located in the southwest corner of Bangladesh, between 21030′ and 22030′ North and 89000’and 89055′ East (Islam 2010). A significant part of the total area of this mangrove swamp lies within India (West Bengal State). The Bangladesh portion is larger than the portion in India, with an area of 6,071 km2 (62% of total area), and which constitutes 39.5% of the total forest area of Bangladesh (Roy & Alam 2012). Of the Bangladesh part, 70% is land area and the rest (30%) is water (Kabir & Hossain 2008). The wetlands of the Sundarbans consist of about 200 islands separated by about 400 interconnected tidal rivers, creeks and canals (Rahman, Rahman & Islam 2010). The Sundarbans was recognized as a Natural World Heritage Site in 1997 by UNESCO and as a Ramsar Site of international importance in 1992 (IUCN 2014). The combination of various types of ecosystems (forest, coastal and wetland) makes the Sundarbans a home to several uniquely adapted aquatic and terrestrial flora and fauna. The Sundarbans alone supports 53% of birds, 43% of animals, 42% of reptiles, 36% of amphibians, 29% of plants and 17% of fish species of the country’s total biodiversity resources (Baten & Kumar 2010). The Sundarbans is unique in terms of supporting viviparous plant species. Further, it harbours 334 species of trees, shrubs, herbs and epiphytes and about 400 species of wild animals (Behera & Haider 2012). The sundri (Heritiera fomes) is the most important tree species, upon which the Sundarbans is named. Other prominent species are: gewa (Excoecaria agallocha), baen (Avicinnia officinalis), passur (Xylocarpus mekongensis), keora (Sonneratia apetala), goran (Ceriops decandra), ora (S. caseolaris) and hental (Phoenix paludosa). The Sundarbans also offers high value non-timber forest products like golpata (Nypa fruticans), honey, wax, fish, and crabs. This forest region is also rich in its faunal diversity. There are 448 species of vertebrates including 10 amphibians, 58 reptiles, 339 birds and 41 mammals (DoE 2015). Based upon other accounts, the species number of available fauna can be identified as: 400 fishes (Rahman, Rahman & Islam, 2010), 24 shrimps, 7 crabs, 8 lobsters (Rahman & Asaduzzaman 2010) and 77 insects of different orders. This forest provides habitats for diverse aquatic wildlife such as the estuarine crocodile (Crocodylus porosus), turtles (Lepidochelys olevacea), dolphins (Platanista gangetica and Peponocephala electra) and molluscs like the giant oyster (Crassostrea gigas). Nevertheless, the Royal Bengal Tiger (Panthera tigris) is the most magnificent animal. According to the census of 2004, around 440 tigers resided in the Bangladesh part while the most recent estimate puts such to around 106 tigers (Bangladesh Foreset Department [BFD] 2015; The Guardian, 27 July 2015). It is also home to thousands of spotted deer (Axis axis) and barking deer (Muntiacus muntjak). These biotic along with other abiotic resources of the Sundarbans contribute directly or indirectly to the economy both at local and national levels. Figure 2 shows how the resources of the Sundarbans have been utilized for different purposes, contributing both to the lives and livelihoods of local people and to the economy of the country. The livelihood pattern in the Sundarbans area actually varies with seasons and supports an estimated 3.5 million people directly or indirectly (Sarker et al. 2016). Wood and golpata collectors (Bawalis), fishermen (Jele), honey and wax collectors (Mouals), shell collectors (Chunary), and crab collectors are among the major occupational groups of the adjacent forest region. The local people have maintained their livelihoods, specifically by depending on the resources of the Sundarbans, in primarily two ways (Getzner & Islam 2013). First, local households earn cash income by selling ecosystem products, such as fish, honey and so on at local markets. Second, the use of natural resources provides substantial subsistence such as food, fresh water and timber. The lives and livelihoods of the local people are mainly related to the physical and biological (or, biodiversity) resources as depicted in Figure 2. The Sundarbans has experienced major ecological and physiographical changes due to anthropogenic pressures and climatic disorder, which have taken a heavy toll on the regenerative capacities of the forest and its ability to maintain sustainability. Such pressures have resulted in the continuous decline of forest coverage and of biodiversity resources. In 1776, the size of the Sundarbans was 17,000 km². At present, it is only almost half this total area (Islam & Gnauck 2009). A recent report shows declining trends in forest areas both in India and Bangladesh (Figure 3). Aziz and Paul (2015) studied changes in the forest cover, marsh and water areas between1989 and 2000, and also up to 2010 in the Khulna and Chandpai ranges and found that sundri trees had declined during both time spans. Also, the total forest area declined by 3.60%. The reduction of volume of important tree species of the Sundarbans can also be analysed through forest inventories (Table 1). Three important inventory reports on the Sundarbans were prepared in 1959, 1983 and 1996 (FAO 2011). The trend in growth of trees in each case is found to be declining. Another recent study (Giri et al. 2015) identified mangrove forest coverage (gain and loss) from 2000 to 2012 in South Asia and stated that the forest coverage of the Sundarbans decreased by 1.2%from 1970 to 2000. The degradation of floral diversity also wields negative impacts on faunal diversity. As many as 20 globally threatened species inhabit the Sundarbans. The most endangered species are the Batagur baska (turtle), the Ganges River dolphin and the Irrawaddy dolphin. Other threatened wildlife species include: pythons, king cobras, adjutant storks, white-bellied sea eagles, clawless otters, masked fin-foots, ring lizards, river terrapins, fishing cats, spoon-billed sandpipers, and eagles (DoE 2015). The most important faunal species, the Royal Bengal Tiger, is also listed as an endangered species by the IUCN. Based on the above discussion on the structure and benefits of the Sundarbans, Table 2 provides a summary of the characteristics of the Sundarbans as regards SEPLS. The two major indicators for identifying SEPLS have been specified here based on the definition provided principally by the Satoyama Initiative and illustrated by others (Gu & Subramanian 2012; Ichikawa 2013; Bergamini et al. 2013). It should, however, also be noted that the balance of such a SEPLS has continuously been threatened as has been briefly discussed in the sub-section on changes, resulting from interactions between nature and external people. Mosaic of production landscape/seascape Yes It is a mangrove forest that includes forest, coastal and wetland ecosystems, supporting diverse production activities. Harmonious interaction between humans and nature and well-being of both Yes It provides the IPLCs different options for maintaining livelihoods and the IPLCs provide protection to the forest and its resources through traditional livelihood practices. The discussion provided in the above sections clearly demonstrates that the ecosystem of the Sundarbans is ecologically and economically important, but that it has become more vulnerable as it faces major changes with the passage of time. The Unnayan Onneshan (UO) research institute, by conducting several research activities, identified that the IPLCs have hardly any rights over forest resources and negligible power to execute choices and livelihood strategies in a sustainable way. The power is actually in the hands of external agents (e.g. the Forest Department, local money lenders, dacoits, and politically powerful individuals). Thus, the UO felt that the forming of cooperatives could serve as a vehicle to promote the power of IPLCs and to create a scope for collective actions, including equipping people in the practice of traditional knowledge and livelihood strategies. The results of the activities of cooperatives are briefly described below. The UO provided technical assistance to form three cooperatives—the Koyra Bonojibi Bohumikhi Unnayan Samity (Koyra Forest Dependent Peoples’ Cooperative), the Horinagar Bonojibi Bohumukhi Unnayan Samity (Horinagar Forest Dependent Peoples’ Cooperative), and the Adibasi Munda Unnayan Samity (Indigenous Munda Cooperative)—through the Community Based Management of the Sundarbans project that has been running since 2006. The members of the cooperatives are from the two upazilas (An upazila [sub-district] is an administrative unit in Bangladesh) of the Khulna district—Koyra (unions [A union is an administrative tier and an upazila consists of a number of unions] of North Bedkashi, South Bedkashi and Koyra Sadar) and Paikgacha (Chandkhali and Goroikhali)—and are involved in the cultivation of resources from the different and adjacent parts of the Sundarbans. 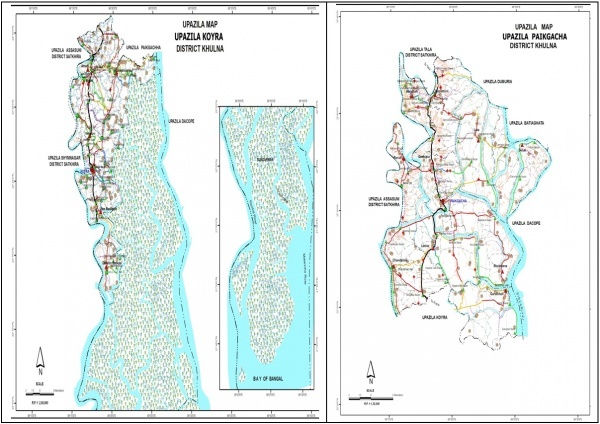 An estimated 73,000 people of Sundarbans communities live in these two upazilas (Figure 4). The cooperatives have 300 resource users as members and more than 5,000 resource users are the indirect beneficiaries of the formed cooperatives. The UO provides logistic and technical support to the cooperatives. The cooperatives serve as a common ground for sharing information, experience and enhancing cooperation among members. The members conduct regular meetings to discuss different problems and devise collaborative actions and solutions. They usually meet formally twice a month to chalk out work plans and discuss the progress of activities. Generally, they meet during the first week of every month to prepare a monthly work plan and during the last week of every month to evaluate progress. Thus, they develop common understanding on managing the Sundarbans, and foster sharing of traditional knowledge and practices. On a whole, the establishment of cooperatives on the one hand has helped traditional forest peoples to follow the path toward claiming their rights in a journey towards self-sufficiency. On the other hand, the cooperatives foster the participatory monitoring and sustainable use of the biodiversity resources of the region. Apart from this type of progress, socioeconomic development in the local communities has been further advanced by the various regular activities of the cooperatives—the creation of common funds through the subscription and utilization of funds for individual needs. The UO has also facilitated the Community-based Mangrove Agro-Aqua-Silviculture (CMAAS) practice and some biodiversity conservation programmes. Finally, the UO conducts regular research on the Sundarbans. The Forest Department (FD) is the leading management authority of the Sundarbans Reserve Forest (SRF). Due to legislative flaws and enforcement problems, exploiters, specifically politically and economically powerful groups, have continued to encroach into the forest region and extract resources. Conversion of land into commercial shrimp farming is the largest human threat to the Sundarbans mangrove ecosystem. These farms are put in place by powerful local people, connected to political and administrative structures at the local and national levels. The National Forest Policy of 1994 recognized community participation in the management process. However, the current management system is viewed by local people as an overly restrictive process that limits their involvement. They face many barriers to exercise their rights to use resources. This results in a form of tenurial insecurity among the local inhabitants. In recent decades, powerful agents at both national and international levels have successfully pursued the government to approve many development projects. For instance, the most recent and highly controversial is the Rampal Power Plant Project, a coal-based power plant, fraught with triple jeopardies in the three domains of environment, economy and technical feasibility, and which may be dangerous to the integrity of the Sundarbans. The UNESCO World Heritage Committee has cited a series of flaws. There are allegations that government agencies and functionaries have not only facilitated land-grabbing by rich and powerful interests but also are rapacious in their own right. Forest Department officials reportedly harass collectors of forest produce for extra tolls. There is evidence on the cutting and selling of trees by timber traders and smugglers, and the killing of animals by poachers with the alleged involvement of forest officials. Following a suggestion from donor agencies, the government has introduced some exotic species in the adjacent areas of the Sundarbans under a social forestry programme. These exotic species do not comply with natural ecosystems and consequently are altering ecological processes. On 15 November 2007, the cyclone Sidr hit Bangladesh’s southwest coast. The Sundarbans absorbed the main blow of Sidr, saving human lives by slowing down nature’s wrath. According to the Forest Department, one fourth of the Sundarbans forest area was damaged by Sidr. Specifically, 8% to 10% of the forest was destroyed completely, while 15% was partially damaged (The Daily Star, 20 November 2007). The cyclone Aila struck the same region again on 25May 2009. A large number of trees were uprooted and infrastructure damaged in the Sundarbans and its adjacent regions. Climate change has wielded negative impacts by increasing the salinity of water and soil composition. The forest is also becoming vulnerable to sea-level rise, a consequence of climate change. This sub-section is key to understanding the intrinsic relations between livelihood strategies and the sustainability of nature in the context of this specific case study on the Sundarbans. It illustrates that traditional practices lead the IPLCs to harvest the resources of Sundarbans in a manner that is fully compatible with the requirements of conservation and sustainable use. The communities sensibly believe that the forest provides their livelihoods and that it must be protected from all sorts of misuse and abuse for the present and future generations. Therefore, they follow certain rules according to which they harvest resources with the utmost care and love for the nature. Honey is considered to be an important non-wood forest product. The giant honeybee (Apis dorsata) is the principal honey producing species of the SRF. When collecting honey from honeycombs, usually during the months of April, May and June, the Mouals (honey/wax collectors) usually cut a specific section (about two-thirds) of the honeycomb and leave the rest for reproduction. They also try to make sure that no young bees are killed while collecting honey and squeeze beehives by hand, never using metal tools. They revisit the colonies after a period of one month or more depending upon the size of the colony and the flowering conditions of nearby vegetation. When collecting the honey, the Mouals produce smoke using dry leaves but never put fire on beehive. Honey is a sacred food to them and therefore, they are careful not to adulterate honey. The Bawalis (wood collectors) follow several rules to ensure the sustainable harvest of wood. They leave at least one stem in each clump of trees after cutting. 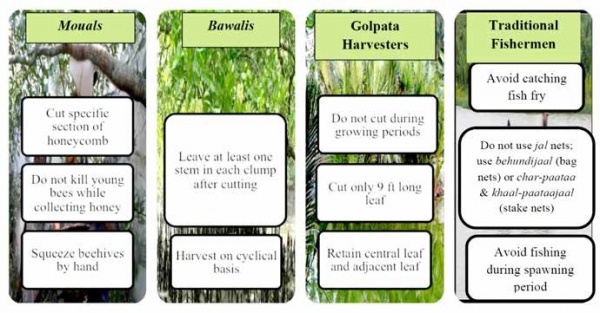 Once the Bawalis have harvested wood from a compartment, they will not use the same compartment for harvesting the following year, but will harvest on a cyclical basis so that there is an adequate regrowth of plants. They usually cut wood where there is an abundance. They do not cut young and straight trees. The Bawalis believe that this tidal forest is a sacred place and that the Creator washes the forest twice a day and maintains its sanctity. When the Bawalis cut wood, they are guided by such beliefs and try to maintain sustainable use of the forest. According to the rules followed by golpata harvesters, exploitation in any area is not allowed more than once a year and is not allowed during June to September specifically as it is the growing period of golpata (Nypa fruticans). They cut only leaves that are approximately nine feet long, and the leaves are cut in a way so that the central leaf and the leaf next to it in each clump is retained. They maintain the rule that the flowers and fruits shall in no way be disturbed when cutting leaves. They also maintain that young plants with only one utilizable leaf should not be cut. The Jele (traditional fishermen) know that catching fry (young fish) will ultimately deplete the number of fishes in the water bodies and thus they try to avoid doing so. They usually do not use jal nets (very small-meshed nets). Rather, they use nets behundijaal (bag nets) or char-paataa and khaal-paataajaal (stake nets), which have been innovated and customized scientifically to benefit the Sundarban’s unique waterscape. They use big-meshed nets for rivers and small-meshed nets for closed water bodies. They do not catch all species of fish and also avoid fishing during spawning periods. In addition to the above-discussed traditional rules and practices, the IPLCs have diversified their livelihood options by utilizing their traditional knowledge and experiences as responses to the continuous deterioration of their livelihood opportunities due to man-made pressures. They continuously try to cope with changing conditions through initiating innovative management practices. For instance, they have developed innovative techniques in agriculture that are adaptive to local biophysical conditions while ensuring environmental sustainability. In response to commercial shrimp cultivation that has emerged as a major threat to this mangrove ecosystem, an alternative—Community-based Mangrove Aqua Silviculture (CMAS)—has been innovated by the local community. Local small farmers grow their rice seedlings in raised land with less risk of saline water contamination to ensure maximum survival before transplantation in fields. The local communities harvest rice plants at 8 to 12 inches high from the ground, responding to high salinity contents in soil and water. Practically, saline contaminated rice straw decomposes within a very short time if used as roofing materials. Therefore, they are allowed to decompose in the field, which in turn adds organic matter, mainly nitrogen, to the soil and also reduces saline intensity, which is beneficial for the growth of their next crop. Since most of them are landless, local small farmers grow vegetables on sheds or roofs, in yards or the backyards of their houses. CMAAS refers to the practice of integrated cultivation of some mangrove faunal species such as crabs, oysters or fishes (e.g: shrimps, bhetki [Lates calcarifer]) and floral species such as golpata (Nypa fruticans), keora (Soneratia apetala), and goran (Ceriops decandra), at the same time on any swampy land of brackish water. In addition, integrated cultivation of some mangrove floral species like golpata and a few faunal species like tengra (Mystus tengara), baila (Awaous guamensis), and tilapia (Tilapia nilotica), are practiced on fresh water swampy land. CMAAS culture is found to be more profitable and have negligible environmental impacts, whereas commercial shrimp culture is cost effective but wreaks havoc on the environment. The economic and ecological returns of CMAAS culture are presented in Table 3. Ecological Returns Biodiversity conservation, protection from river and land erosions, reduced pressure on the Sundarbans, provision of breeding ground for aquatic species, no use of chemical fertilizers, no pollution of water, carbon sequestration, utilization of salinity rich land, etc. Results imply that there is a significant number of anthropogenic pressures that not only cause degradation of biodiversity resources but also negatively hamper the balanced relationship between the biotic and the abiotic components of this mangrove ecosystem. The human induced pressures have mainly intensified with the advent of neoliberalism as the sole strategy of accumulation of wealth, with profits being considered more important through commercialization of forest products and neglect of the intrinsic ecological value of biological resources and diversity. These commercial enterprises, formal and informal, are found to be highly organized in their extractions of resources, and most often are politically patronized and administratively supported. This study has scrutinized the livelihood patterns of the IPLCs, the resource dependent communities of the Sundarbans, and results show that their livelihood strategies (both traditional practices and innovative tools) are hugely effective and beneficial for the protection and maintenance of the natural mangrove ecosystem. More in-depth understanding of their livelihood strategies, however, can be achieved through cost benefit analysis and comparative analyses between the practices of the IPLCs and the methods imposed by external agents. This study only documents the customs and rules of resource harvesting, which are found to be nature friendly. Based on the findings, the study recommends focus to be put on livelihood strategies, which can ensure conservation and sustainable use of the biodiversity of the Sundarbans. Yet, the policies of the government most often marginalize indigenous and customary institutions or simply overlap and create confusions among resource users. The formal management body, the Forest Department, in certain cases, considers the local forest dependent livelihood activities as a threat, while the informal systems based on patron-client relationships harbour a system of overexploitation of resources. The future challenge is, therefore, to understand the evolving nature of institutions—both traditional and formal—to design a comprehensive strategy for biological diversity, combining conservation, sustainable use and access and benefit sharing as fundamental pillars, while integrating these livelihood strategies and innovations, emanating from traditional knowledge and practices, into such a strategy. The lessons from this case study can also be applied with necessary modifications to improve policy decisions and management interventions of similar types of SEPLS indifferent countries of the world. There is no denying the necessity to revise laws, regulations and policies relating to the use of resources and to secure the rights of IPLCs. A collaborative management approach needs to be promoted through innovation of various forms of institutional arrangements and livelihood options. As a Contracting Party to the Convention on Biological Diversity (CBD), Bangladesh is committed to implementing conservation and sustainable management of its biological diversity. These findings, however, reveal that the most important biodiversity hotspot of this country, the Sundarbans, is under the threat of continuous degradation. Its resources have been exploited beyond the sustainable limit due to the structural rigidities, embedded in, and reproduced by, institutions and unequal power sharing arrangements. In this process, the lives and livelihood conditions of the indigenous people and local communities (IPLCs) are also being adversely impacted. The traditional knowledge-based livelihood strategies of the IPLCs are found to be effective in maintaining sustainable utilization and conservation of this forest ecosystem. Yet, their knowledge has often been neglected under the formal institutional management system. Such unique production methods, as practiced by the local people of the Sundarbans, can significantly contribute to the revitalization and sustainable management of resources through symbiotic human-nature relationships. These kinds of knowledge-based livelihood strategies of the local people, which ensure collaborative management system of SEPLS and equitable benefit sharing, should be promoted at different tiers of policy levels—ranging from international to local—to steer the course of socio-economic development onto a pathway that combines the welfare of human beings and of nature. Aziz, A & Paul, AR 2015, ‘Bangladesh Sundarbans: Present Status of the Environment and Biota’, Diversity, vol. 7, pp. 242-269. Baten, MA & Kumar, U 2010, ‘Responses to the changes in the Sundarbans’, paper presented at International Conference on Biological and Cultural Diversity, UNCBD, 3-5 May, Montreal, Canada. Baten, MA 2011, ‘Community Mangrove Aquaculture at Sundarbans Impact Zone: Examples of using traditional knowledge in adaptation to climate change’, paper presented at IPSI Second Global Conference, Kenya. Behera, MD & Haider, MS 2012, Situation Analysis on Biodiversity Conservation Ecosystem for Life—A Bangladesh India Initiative, IUCN. 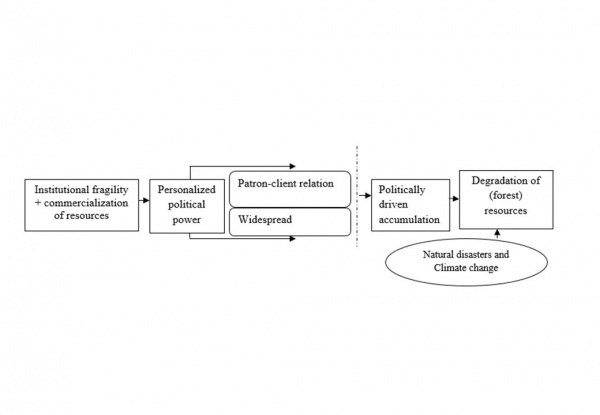 Bergamini, N, Blasiak, R, Eyzaguirre, P, Ichikawa, K, Mijatovic, D, Nakao, F & Subramanian, SM 2013, Indicators of Resilience in Socio-ecological Production Landscapes (SEPLs), UNU-IAS Policy Report, UNU-IAS, Japan. CEGIS 2016, ‘Joint Landscape Narrative by India and Bangladesh’, Center for Environmental and Geographic Information Services (CEGIS), unpublished report. Chambers, R & Conway, GR 1992, ‘Sustainable rural livelihoods: practical concepts for the 21st century’, IDS Discussion Paper, no. 296, Brighton: Institute of Development Studies. Department of Environment (DoE) 2015, Fifth National Report to the Convention on Biological Diversity: Biodiversity National Assessment and Programme of Action 2020, Ministry of Environment and Forest (MoEF), Government of the People’s Republic of Bangladesh (GoB). FAO 2011, Bangladesh forestry outlook study: Asia-Pacific forestry sector outlook II, Working paper series, no. APFSOS II/WP/2011/33. Getzner, M & Islam, MS 2013, ‘Natural Resource, Livelihoods and Reserve Management: A Case Study from Shundarbans Mangrove Forests, Bangladesh’, Int. J. Sus. Dev. Plan., vol. 8, no. 1, pp. 75–87. Giri, C, Long, J, Abbas, S, Murali, RM, Qamer, FM, Pengra, B &Thau, D 2015, ‘Distribution and dynamics of mangrove forests of South Asia’, Journal of Environmental Management, pp. 101-111. Gu, H & Subramanian, SM 2012, Socio-ecological production landscapes: relevance to the green economy Agenda, UNU-IAS Policy Report, UNU-IAS, Japan. Ichikawa, K (ed.) 2012, Socio-ecological production landscapes in Asia, UNU-IAS, Japan. Ichikawa, K 2013, ‘Understanding Socio-Ecological Production Landscapes in the Context of Cambodia’, International Journal of Environmental and Rural Development, vol. 4, no. 1, pp. 57-62. Islam, MSN &Gnauck, A 2009, ‘Threats to the Sundarbans Mangrove Wetland Ecosystems from Transboundary Water Allocation in the Ganges Basin: A Preliminary Problem Analysis’, International Journal of Ecological Economics & Statistics, vol. 13, no. 9, pp. 64-78. Islam, SN 2010, ‘Threatened wetlands and ecologically sensitive ecosystems management in Bangladesh’, Front. Earth Sci., vol. 4, no. 4, pp. 438-448. 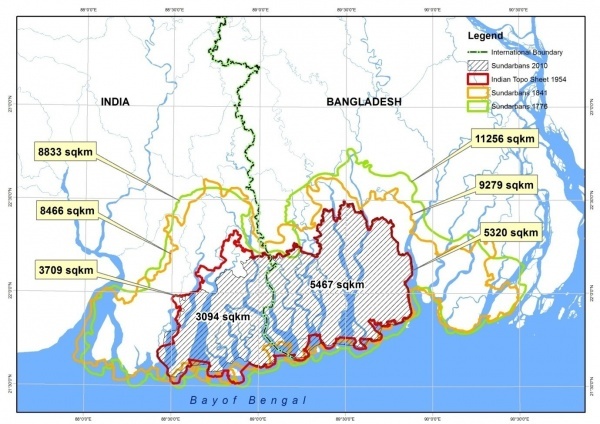 IUCN 2014, Bangladesh Sundarban Delta Vision 2050: A first step in its formulation, IUCN Bangladesh. Kabir, DMH & Hossain, J 2008, ‘Resuscitating the Sundarbans: Customary Use of Biodiversity and Traditional Cultural Practices in Bangladesh’, Unnayan Onneshan, BELA, Forest Peoples Programme & Nijera Kori, Bangladesh. Rahman, MR & Asaduzzaman, M 2010, ‘Ecology of Sundarban, Bangladesh’, J. Sci. Foundation, vol. 8, no. 1 & 2, pp. 35-47. 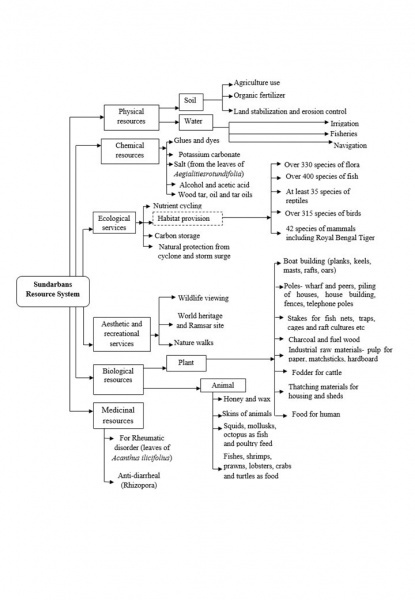 Rahman, MM, Rahman, MM & Islam, KS 2010, ‘The causes of deterioration of Sundarbansmangrove forest ecosystem of Bangladesh: conservation and sustainable management issues’, Aquaculture, Aquarium, Conservation & Legislation International Journal of the Bioflux Society (AACL Bioflux), vol. 3, no. 2, pp. 77-90. Roy, AKD &Alam, K 2012, ‘Participatory Forest Management for the Sustainable Management of the Sundarbans Mangrove Forest’, American Journal of Environmental Science, vol. 8, no. 5, pp. 549-555. Sarker, SK, Reeve, R, Thompson, J, Paul, NK & Matthiopoulos, J 2016, ‘Are we failing to protect threatened mangroves in the Sundarbans world heritage ecosystem?’. Titumir, RAM 2011, ‘Property Rights, CSU and Development’, paper presented at the Expert Committee Meeting on CBD Chapter 8(j), CBD Secretariat, Montreal, Canada. Titumir, RAM 2014, ‘Financialization (Market) in Conservation of Nature: Issues and Lessons’, paper presented at the Second Dialogue Seminar on Scaling up Biodiversity Finance, 9-12 April, Quito, Ecuador. Titumir, RAM 2015, ‘IPLCs Contribution to Aichi Biodiversity Target 10: A Case Illustrated through TRUs of Sundarbans in Bangladesh’, paper presented at the Side Event on Indigenous Peoples and Local Communities’ Contributions to the Implementation of the Strategic Plan for Biodiversity 2011-2020, 6 November, Montreal, Canada. Titumir, RAM, Afrin, T & Islam, MS2017, Well-being of Nature: Biodiversity, Water Resource and Climate Change in Bangladesh Context, unpublished book (in progress), Dhaka: Unnyan Onneshan. Unnayan Onneshan (UO), 2010, ‘Community-Based Mangrove Aqua-Silvi-Culture (CMAS Culture): Promoting as a Community Adaptation Tool and an Alternative to Commercial Shrimp Culture’, Research Report.